I'm excited to introduce the gospelcenteredfamily.com readership to a new children's book and family devotional for Christmas. The book is called Just Nicholas (Matthias Media, 2015). It tells the story of Nicholas of Myra, the Christian saint from whom has come the legend of Santa Claus. It's a story older than Santa told in a way that is fun for kids and helpful for parents. Jared: What is it like writing a book with your sister? Annie: It's a dream come true to work with my sister. We've been writing and illustrating things together since we were little girls and always daydreamed about doing a "real" book together one day when we were grown ups. We're also the perfect team because we have a great relationship that allows us to give and receive feedback openly. Growing up as close friends and in the same home, we share a visual and cultural history that puts us on the same page most of the time; and, even when we have different ideas about something, we understand each other so well that it's easy to communicate our vision. Tessa: Annie and I grew up working on projects together. Plays, books, games, epic paper chains, we were always doing things like that. Doing a book with Annie was sort of like doing a book with a version of myself that is good at all the things that I’m not good at and can read my mind. So it was great. Jared: What are the top things illustrators should remember when working with authors? What are the top things authors should remember when working with illustrators? Tessa: I think it’s important for illustrators to remember that authors might not think the same way or use the same vocabulary that they do. Same thing for authors. You kind of have to hear what they’re saying from their perspective, then translate it into your own vocabulary. Annie: When illustrators are working with authors, it's helpful to remember to ask lots of questions up front. Pump them for information about the research they did. Ask context questions about age, clothes, time of year, time of day, etc. to build your visual understanding of the particular world in this story. It may seem obvious, but when authors are working with illustrators, they should think about how their story will play out on the page. How will it break down in terms of words per page and how will those words translate visually? Is there an action or image that will move the story along visually? If not, how can you rewrite in a more active way? Jared: Tessa, you have three books (with three different publishers) coming out this Fall/Winter, the PROOF Pirates Family Devotional, The Very First Christmas, and Just Nicholas. What did you learn while doing so much illustration this year? What is changing about your work as the demands grow? Tessa: The more I illustrate, the more I learn. It’s one of those things that I can’t really just practice without having a project because there are so many facets. You have to tell a story, you have to illustrate the context well, you have to be consistent throughout the project, you have to be engaging, you have to make a lot of decisions and they all have to agree with each other. You also have to get better at things you’re not good at because there are so many pieces to illustrating. It’s definitely a challenge and it’s very humbling. I studied art, but not illustration in particular or design, so it’s very much a learning process for me. A lot of people have been very supportive and gracious. I had to ask for a lot of help, especially from my husband and my parents. There’s no way I would have made deadlines without their help and support. I always feel a little surprised when I’m asked to do another project, so I think I’m realizing that this is work that God is bringing to me as well. Since working on projects is what gives me practice and experience, I’ve been experimenting more with different mediums and techniques. So really as the demands grow I get more seasoned I suppose. I’ve had to do a lot of self teaching and I have a lot more to do. It’s always invigorating to learn to do something new, or at least a different way than you have been doing it. Jared: What medium are you using for the illustrations in this book? Tessa: I used watercolor, colored pencil and ink in this book. I also used a lot of masking fluid and guache. There is a lot of contrast in the dark, snowy night pictures that those two things helped with. Jared: Annie, what led you to want to write a book about St. Nicholas? Annie: A couple of years ago, Tessa was looking for books about Santa Claus to read to her young daughters. She found historical accounts of St. Nicholas and fantastical stories about Santa, but nothing that addressed the truth in an engaging, honest, and non-preachy way. So she asked me to write a book to fill the gap she found and I started working on research and drafting a story. Jared: Who is this book for? How can Nicholas's story help the child who grows up getting everything he wants for Christmas? How can his story help the child who grows up in poverty--getting very little? How can parents and grandparents use it? I genuinely believe that this book is for everyone. That's why I'm so proud of it. Parents and grandparents can start reading it to their children from their very first Christmases, yet it remains relevant for older kids and even grown-ups. It is for practicing Christians and for people who are just curious about the origins of Santa Claus. It provides adults with a tool for approaching the 'Santa conversation' without saying "Santa isn't real." Instead, it preserves the magic of the holiday by exploring the transformative power of grace. In John 8, Jesus makes the bold statement that if we hold to the good news of his word, 'you will know the truth and the truth will set you free.' Because of that, I think the story of Nicholas cuts through the gift-based expectations that plague both children and grown-ups at Christmas time. It frees us to be thankful for what we've been given and empowers us to choose radical generosity in our humdrum daily lives. I'm grateful for Annie and Tessa's work, and their service to the children of our church community. 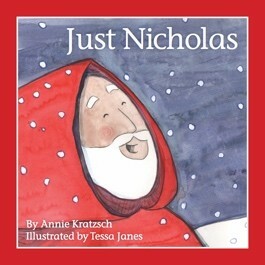 As we enter the holiday season, be sure to pick up a copy of Just Nicholas for the children in your family. How do you handle the whole issue of Santa Claus in your ministry? How would you redirect a group of children at church who are debating his existence? What advice would you give Christian parents and grandparents about Santa? There’s no way around it, pretty much every kid in America is going to know about Santa Claus. Thanks to Coca-Cola, the Macy’s Thanksgiving Day parade, and mall atriums everywhere, the jolly ole’ man in red is a cultural Christmas staple who probably isn’t going away any time soon. But as Christian parents or Sunday School teachers, is it a good idea for us to teach our kids that Santa Claus is coming to town? I think we’ll all agree that during the Advent season, it’s our job to teach kids about the true meaning of Christmas—that Christmas is about Jesus’ incarnation and birth as a baby in Bethlehem. It is about God saving people created in his own image by coming to earth Himself as a man. As long as the incarnated Jesus is the focus of our stories and celebrations, I think it’s fine to tell your kids about Santa. After all, unless they’ve been completely sheltered from the culture, they probably already know. Teach Kids about St. Nicholas. Nicholas of Myra lived in the 13th century. He's famous for paying the dowries of three poor girls in his town by leaving coins in stockings they had hung up to dry. The Saint Who Would Be Santa by Adam English is the best research I've found on Nicholas. English argues that of all the legends about Nicholas, the one about him paying the dowry for the poor girls is the one that carries the most historical weight. It's repeated often and it's never attributed to a different one of the Catholic or Orthodox saints, so it rings true. I've also found the Christian History Made Easy video (embedded below) by Dr. Timothy Paul Jones to be a helpful resource. If you're a history geek, you'll love the discovery that Santa Claus likely slapped the heretic Arius during a counsel debate. One way to point our kids to Christ and away from Christian commercialism is to trace Santa back to his roots in the life of a real man who was changed by living in relationship with the Lord. We do well to celebrate Nicholas's life and teach about him to our kids. Remind kids that they’ll never be good all the time! Santa is not our judge, but if he really was making a list, none of us would be on his “nice” list. Let’s be honest, we’re all still naughty deep down in our hearts. There has been only One who made it on the “nice” list. Jesus, being born of a virgin in a little manger in Bethlehem, was the only person who made it onto God’s “nice” list. And we have hope because, through faith in Him, God has made it possible for us to be added to that list as well! He sees us in all our sin, but He still gives us His good and perfect gifts. So the next time a group of kids are arguing over Santa’s existence, try to point them to Jesus by saying, “If Santa is real, could you really make it onto his nice list?” and by reminding them that Jesus is the true reason for the season. I wrote the original version of this post with my friend Fletcher Lang for a December 2009 edition of Tony Kummer's Children’s Ministry Think Tank. You can follow the responses of other Children’s Ministry leaders here. What do you teach your kids about Santa Claus? Our friend Deepak Reju wrote a post for the Gospel Coalition on identifying those who prey on children. This is a topic we will be hitting hard in January 2015. Deepak writes, "The first step in protecting our children is figuring out who is plotting evil against them." Pastors, parents, no one likes to talk about this stuff, but we must. Greg Baird had a post on his blog entitled A Primer For Parenting. In it he explains, "It's not a magical 'formula for success' ... it's even better. It a Biblical framework that provides the most solid foundation - a primer - for successful parenting and faith development in our kids." Parents, go see what he has to say. Craig Jutila had a post on facing fears. He writes, "... when fear has it's grip around my throat I can't quite choke out the words 'don't be afraid' because I am afraid." It doesn't matter if you're a parent or even a past, we all have fears. Craig helps us all overcome and gain victory over them. Sam Luce had a post on gratitude. He wrote, "... gratitude recognizes that you have been given something you don’t deserve." This is one of those disciplines that needs to modeled for our kids so they catch it. Gratitude can't really be taught. Those of us who are parents or those who work with kids would do well to ready this post. My (Pat) friend Amy Dolan had a great post on the Santa question. I'm going to spoil it (a bit) and share her conclusion, "bottom line. spend time thinking about how you want the season to be for your family." Amy give practical advice on both sides of the issue. Parents, wisdom is required here. Thom Rainer had a (guest) post on bridging the generational gap. It reads in part, "... generations often resist one another without knowing one another." Pastors, the different generations need each other and we should be doing everything we can to encourage the destruction of the gap. KidzMatter and the International Network of Children's Ministry (INCM) put together a promotional video about a virtual conference they are putting on next February. For those of you like me (Pat) who have limited budget to travel to conferences, this provides an alternative. We all need to be challenged and encouraged. What are you reading online that we may have missed? Leave a comment (and a link) for us to check out.